Meteor House » New Phileas Fogg ebook! We recently announced Phileas Fogg and the Heart of Osra, a brand-new novella by Josh Reynolds, and his second sequel to Philip José Farmer’s Other Log of Phileas Fogg. 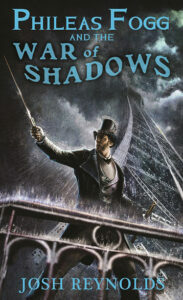 Today we’re thrilled to announce that his previous novella, Phileas Fogg and the War of Shadows, is very nearly out of print, but is now available as an ebook! Comments Off on New Phileas Fogg ebook!